Senior government representatives, Zimbabwe's CAA chief and senior staff members from fastjet including CEO Ed Winter and CCO Richard Bodin all gather for photos on the Harare apron! fastjet’s inaugural flight between Dar es Salaam in Tanzania and Harare in Zimbabwe took off yesterday (5th August), marking the launch of the low-cost airline’s third international route across Africa, and the only direct air link between the two African capital cities. Previously, those wishing to travel between Dar es Salaam and Harare had to spend at least two days travelling the approximately 2200km by road, or they had to fly via Nairobi in Kenya or Johannesburg in South Africa involving lengthy layovers. 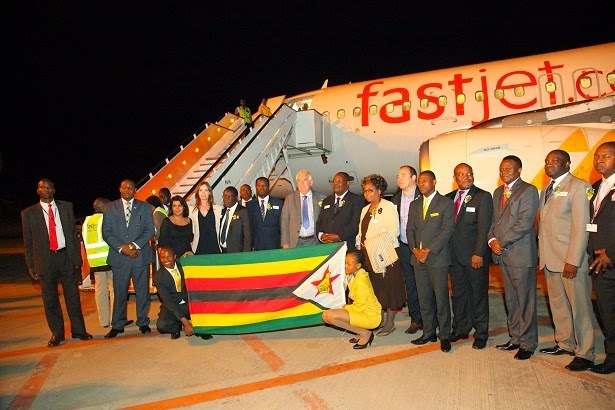 The new route offered by fastjet provides a solution to this problem, with twice-weekly flights now flying between Harare International Airport in Zimbabwe and Dar es Salaam’s Julius Nyerere International Airport in Tanzania. No visas are required for citizens of the two countries for visits of less than 90 days. fastjet flights depart Dar es Salaam at 19h25 and arrive in Harare at 20h55 on Tuesdays and Saturdays, with a flight time of two hours and 30 minutes. The return flight to Dar es Salaam departs Harare at 21h35, arriving at 01h00 the following morning. Dar es Salaam is one hour ahead of Harare. “The Government of Zimbabwe is delighted that fastjet is expanding its international route network to include Harare, and that in doing so it is bringing its low-cost, reliable and safe service to the people of Zimbabwe,” says Zimbabwe’s Minister of Transport, the Honourable Dr Obert Mpofu. Tickets for flights on the direct route went on sale in June 2014, with fares starting as low as US$50 one-way, excluding airport and government taxes - considerably more affordable than the non-direct flights that are currently the only air link between the two cities. With its low-cost fares, fastjet is making air travel more accessible to even more people with the launch of this route, and expects many of its passengers travelling between Harare and Dar es Salaam to be first time flyers. Supporting this expectation is the research undertaken by the airline after its launch in Tanzania, which showed that 38% of its passengers were first time flyers. Forward bookings for the twice-weekly flights are well ahead of management expectations and with the first flights from Zimbabwe already operating to full capacity, fastjet has decided to add a third rotation which will go on sale today. fastjet operates internationally from Dar es Salaam to Johannesburg, Lusaka and now Harare, and has a significant Tanzanian domestic network including flights from Dar es Salaam to Mwanza, Kilimanjaro and Mbeya.